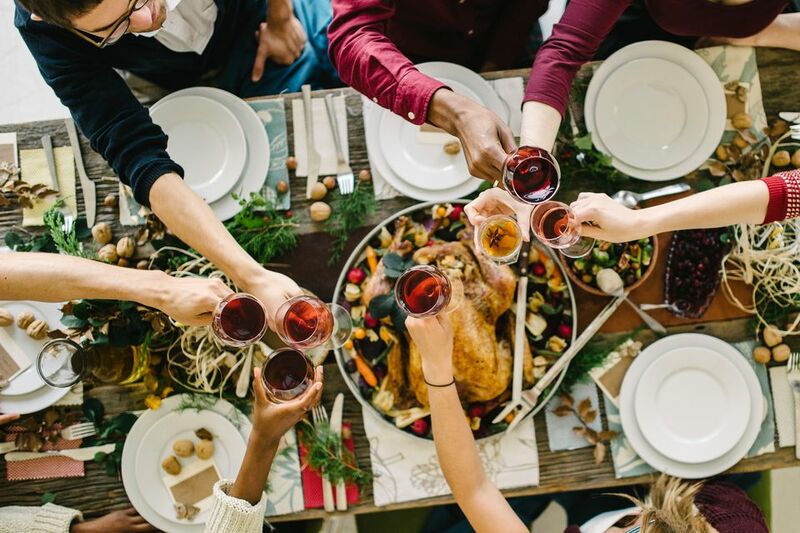 Thanksgiving is a time to come together with family and friends for a big, delicious meal with more calories than anyone should eat in a whole day … or maybe even a week for some people. That sounds like fun, but don’t forget about possible dietary concerns, some of which can be life threatening. For many years, people had no idea what caused their digestive distress or other symptoms of food intolerances and allergies. Now people have wised up and learned that they’re eating foods that they need to avoid. There are also people who have chosen to eliminate large categories of food for a number of reasons, including health, religious rules, human rights, animal rights, and concern about the environment. If you’re hosting this year’s Thanksgiving dinner, show respect for your guests by honoring the dietary restrictions. Don’t try to sneak anything into the casseroles or gravies. Whether the people have given up food for health or conscience, their reason is valid to them, and it’s not up to someone else to force any food on them. As the host, it’s your responsibility to follow through with making sure everyone has a pleasant time and gets enough food. Although you don’t have to eliminate anything you want to serve, it’s nice to have a variety of dishes so people with dietary restrictions can pick and choose foods they’re able to eat. There are more allergies and other dietary concerns than there is room here, but below is a list of some of the most common food issues to be aware of. When inviting your guests, ask for specific foods they can’t or won’t eat. If you use processed ingredients, read the labels to make sure one of the culprits isn’t hiding in the mix. No meat or fish – Whether someone can’t eat meat because of a health condition or they don’t eat it because of other reasons, it’s always a good idea to provide meat substitutes. Some options include soy-based items such as tofurky, lentils, or vegetable protein. Vegan – Those who are on a vegan diet don’t eat meat or any animal product, including eggs, cheese, cow’s milk, and butter. If you’re not sure what to prepare for someone who is vegan, ask the guests specifically what they can’t have and if there is something they would like to have. They might even offer to bring something that can be shared with the rest of the people. Gluten-free – Although there are some people who choose to go gluten-free, many who follow this diet are doing so for health reasons. Celiac is a serious disease that can have dire consequences if the diet isn’t followed. Most people who have celiac disease can’t have any products made from wheat, barley, or rye. Lactose intolerance – Anyone who has intolerance to milk products should follow a diet designed for those with lactose intolerance. Lactose is milk sugar that can cause bloating, gas, and other, more serious, digestive disorders. Look for products that either don’t have any dairy in them or have had the lactose removed. If you’re not sure what you can serve, ask the guest in advance. Shellfish allergy – There are varying degrees of allergies to shellfish. Don’t risk serving shrimp, oysters, lobster, or any other shellfish to someone who isn’t supposed to eat it. Peanuts – One of the most serious allergies is to peanuts. Some people who suffer from intolerance to peanuts and products made with them will stop breathing if there is even a small amount of peanut dust in the air. If any of your guests have an allergy to peanuts, make sure everyone knows not to include them in any dishes they bring to the get-together. Make sure you ask your guests if there are any foods they can’t eat and ask for suggestions or recommendations. You don’t want your guests to leave hungry, so it’s good form to have enough options for them to enjoy. While preparing the dishes for the dinner, be cautious with pots, pans, spoons, and countertops. Make sure you thoroughly wash everything and don’t stir two different pots with the same spoon. Don’t use the same oil or water for two different foods. Always wash your hands when moving from one dish to another. Don’t embarrass anyone. When you’re hosting a dinner with people who can’t eat certain foods, don’t make a big deal over it. Discreetly point out anything they should avoid and show them some options and substitutes. If they choose to discuss their allergies or foods that they avoid, it’s up to them. Never embarrass your guests by singling them out for their food choices and allergies. When you’re serving your guests at a sit-down dinner, be as inconspicuous as possible if you prepared something different for a guest who has dietary restrictions. Whether you leave something off the person’s plate or swap out a food, there’s no reason to bring it up. If you plan to serve Thanksgiving dinner buffet style, place index cards in front of each dish listing the ingredients. Encourage guests to do the same with anything they bring. An fun idea is to have enough copies of each recipe so guest can take them home and make the dish later if they like it. If you’ve been invited to Thanksgiving dinner at someone’s home, let the host know about your allergies. This can be done in a polite way that doesn’t put them in a bad position. Unless having the food in the room causes your allergies (i.e., peanut allergies) to act up, don’t expect the host to completely change the menu. Most mannerly hosts will accommodate the food issues if they’re aware of them. “My son is deathly allergic to peanuts. We’d love to join you, but if there will be anything served with peanuts, I’m afraid we can’t come.” Give the host the opportunity to offer to leave peanuts out of the dishes. If that doesn’t happen, don’t get upset. Perhaps you can host your own peanut-free Thanksgiving dinner. Don’t be afraid to ask about the ingredients in dishes. If you’re not sure what’s in something you’d like to try, it’s important to know if anything in the food will make you sick or cause you to break your commitment to not eating a particular item.